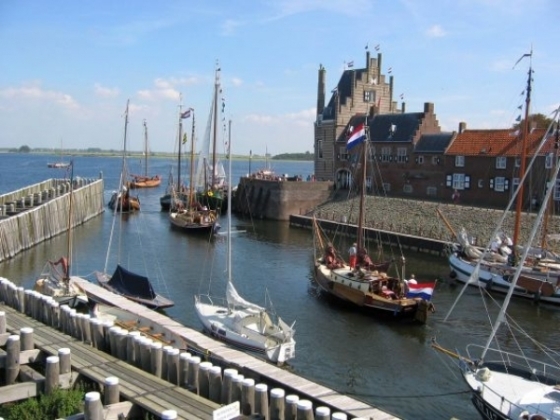 From oysters to medieval towns, from Scottish kings to quiet beaches, the province Zeeland has something for everyone, writes Stephanie Dijkstra. The only thing that is reliable about the Dutch weather is its unreliability. When we set out to explore Zeeland, the sun was shining and the skies were blue. A few hours later, it was overcast, with the sun breaking out every now and then to highlight a few features in the landscape. Then, an hour later, it was pouring, followed by sunshine again in the evening. Another typical Dutch day. When it comes to history, Zeeland, due to its location on (or, if you will, in) the sea, and with one part only accessible by tunnel or by driving through Belgium, has had quite a bit of interaction with nations and peoples that the rest of the country has not had. For instance, Veere; a gem of a village with a quiet rectangular square surrounded by ancient houses, and built around an old church (1348) that Napoleon’s soldiers used as a military hospital. Already in the 13th century, fishermen from Veere regularly ended up in the Scottish fishing villages, establishing ties with Scotland that would eventually lead to Veere’s appointment, by King Jacob V of Scotland, as the warehouse of Scotland in Europe; any goods going from Scotland to the European continent were stored in Veere, before further transportation. At one point, they even a appointed a Conservator of Scottish Privileges in the Netherlands, who oversaw their day-to-day life when it came to inheritances, diplomatic representation, and the fulfillment of positions of importance here. Despite all of this, you will not find any Scottish surnames in Veere anymore – at least not from those days. Though they were still to be found there 150 years ago, it appears that the Scots were never able to get used to life here and eventually all went back home. My Zeeland trip also took me to Kloetinge; founded in the 10th century as a temporary resting place for shepherds, it became so popular that the herders soon began using clumps of sheep dung and other waste to create artificial hills to protect them against the floods. And this is where its name comes from: the old word for clump was kloet – hence the name Kloetinge. The village is surrounded by several artificial hills and mounds, on many of which the remains of defensive towers can be found, underscoring the strategic importance of this area in the Middle Ages. Now it is a quiet little place, with narrow streets, lined with picturesque little houses, leading to an unexpectedly grand square with, at its center, the Geerteskerk church. Kloetinge is what is known as a ringdorp, or ring town, due to its shape, typical of the 12th and 13th centuries: a ring built around a central church, with a circular graveyard around it. In Kloetinge, the church is surrounded by a diamond-shaped green yard, criss-crossed by tree-lined pathways. Across from the church is a rectangular pond, home to happy ducks. All in all, the scene is quiet and peaceful, with a hint of affluence. Yerseke (pronounced EER-suh-kuh) is where you want to go to eat, particularly seafood and more particularly, oysters. Its centre is not particularly intriguing, but it has a harbour and a multitude of seafood restaurants that have been attracting visitors for, well, centuries probably. In the Oosterschelde waterway, you find two types of oysters: the flat Zeeland Oyster – considered by some the finest oyster in the world – and the Zeeland Creuse – a cross between a Japanese and a Portuguese oyster type. How did these oysters end up here?, one wonders. The answer is: they were brought over in the 1960s to stimulate the local oyster trade that had become threatened by the Oyster Disease. The indigenous oysters have since not recovered entirely, but thanks to the Creuse oysters – which have over the years acquired a similar taste as they have been part of the same ecosystem for 50 years now – Zeeland, and Yerseke in particular, can still enjoy an annual influx of oyster tourists between September and May. The oyster season officially opens with festivities in Yerseke in mid-September. If a quiet day (or week, for that matter) on the beach in a cozy town is what you are looking for, then Domburg is the ideal destination. The village is made up of basically one main street that runs parallel to the beach with a few branches in either direction. It has plenty of restaurants and cafés, easy access to a lovely beach and you can rent anything from apartments to entire houses, as well as stay at anything from a B&B, to an unpretentious hotel, to a satisfyingly luxurious spa. It is slightly trendy and upscale. If a city is what you want to visit, then keep in mind that the province’s biggest cities – Middelburg and Vlissingen – have population that is so modest (40,000 and 45,000 respectively) that you feel more like you are in a village than in an actual city. In fact, Middelburg only has 10,000 more inhabitants than it did 300 years ago, when it was the country’s second largest harbour and one of the main cities of the United East Indies Company (VOC). This city is approximately 1,100 years old and used to be surrounded by a ring wall that had been constructed to protect it against the Vikings – or perhaps by the Vikings themselves, that is still unclear. Middelburg has more than 1,100 monuments – placing it in the country’s top ten, one of which is the abbey. This abbey was built in 1100 and eventually home to one of the wealthiest and more powerful abbots in Zeeland – at least, until 1574, when the Prince of Orange forced the monks out and made the building the seat of the provincial Zeeland government, a function it still fulfills, as well as housing Zeeuws Museum and the Roosevelt Study Center. If you are looking for out-of-the-ordinary places to spend the night, visit http://origineelovernachten.nl (for all of the Netherlands, incidentally) and see if you find something to your fancy. Other, more traditional yet exceptional places to spend the night (including cloisters, castles, farms and beach lodges) can be found on www.bijzonderovernachting.nl. In order to prepare yourself for your trip, be sure to visit www.vvvzeeland.nl, though you can also visit a local tourist office in almost any town or city. A longer version of this article first appeared in the September edition of the Xpat Journal.